Few people know how extremely social coyotes are and that they have intense family lives. This is because coyotes avoid people and people areas as much as possible, and because most of their social activity occurs when it is dark, when we can’t see them. Their social interactions occur within a family unit. Coyotes, unlike wolves and feral dogs, do not form what we know of as traditional “packs” which are groups of individuals that are not related. If you do hear of “a pack of coyotes”, the “pack” is always a family of related individuals. New to most folks might be the incredible bonds, devotion, affection and care for each other that coyotes possess and display towards each other — wild coyotes have strong family-lives, not so different from our own! Usually, if a coyote is spotted by someone, all they see is its exterior shell — and most people are thrilled to have seen that — a real coyote! But within that shell there is an entire complex life, an individual and unique personality, and social bonds and structure that few people ever see or are even aware of. Coyotes are one of only 3-5% of mammalian species that mate for life, and both parents cooperatively raise the young. 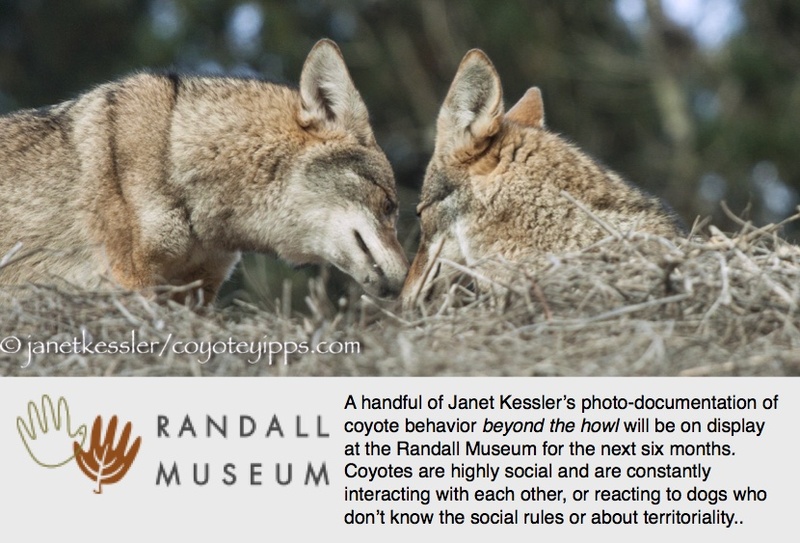 One of the social activities that coyote family members look forward to and enjoy is their daily rendezvous. I was able to observe this behavior again only a few days ago. Unfortunately the photos are almost illegible because it was dark — but since this is how I saw it, this is how I’m going to present it: dark and blurry! The rendezvous began when the two coyotes, a mated pair, came out from their daytime resting spots within a few minutes of each other. It’s interesting that in the families I have seen, Mom and Dad and pups often rest in three separate locations and these are not necessarily in close proximity to each other. On this particular evening, first she appeared, and she ran excitedly down a hill in anticipation of her active day. Within a short time, he appeared. He ran up to where she had been, and soon caught her scent and followed that. When each caught sight of the other, they joyfully ran toward the other, they sniffed each other all over, and then there were the kisses and hugs and rubbing against one another that I’ve seen them do often when they greet each other. There were no squeals of delight this time, but sometimes squealing accompanies the greeting. Then they started chasing each other and tumbling over each other — they would frolic and play before going trekking. This continued for about five minutes before they both, still chasing each other, headed off to collect the rest of the young family. The whole family would be going “a-trekking” once it was pitch black outside: it would be a time for hunting, learning, playing, communicating, and interacting as a family.